The brighter future of hundreds of students at Saint James High School, an Anglican-run school in Besao, Mountain Province, has been burned down into ashes. But we can rebuild the lost hope through the spirit of helping. 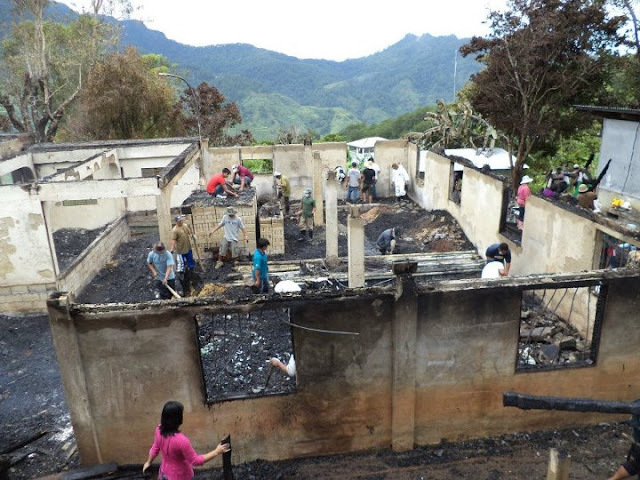 Last Saturday evening, a blazing fire ate parts of the school. No further details are available as of the moment. The investigation has been launched and we are all waiting for the release of the report. According to stories, the fire started at the school canteen. Regardless of who to blame, I believe no one wanted the incident to happen. No one likes to set a school to fire and no one likes to hear about the news. However, such thing occurs in the normal course of life. And for now, blaming should not be the priority. Saint James' computer laboratory, which homes 7 computer units, is totally gone, according to a Besao folk I was chatting with yesterday. 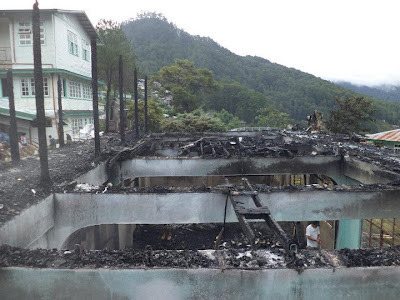 According to him, fire-fighters from the Sagada fire station arrived minutes after the fire heightened. The effort of the fire-fighters, the community and the drizzling sky were not able to put the fire out. An information posted in the Facebook page of the school's alumni group reveals that the whole of the school's faculty building was burned down. Some files, books and other important documents were eaten by the fire. Even the module of the Department of Education's K to 12 was not excused from the disastrous fire. Gladly, further posts confirm that school records from 1980 up to the present were saved, thus only records from 1930 to 1979 are gone. According to DepEd, classes should resume today June 4, 2012. But it seems, classes in Saint James will not have a normal flow. Students will not start with their classes since they have to clean up the remains of their old building. They needed to look for new materials that they will use in the whole school year and beyond.